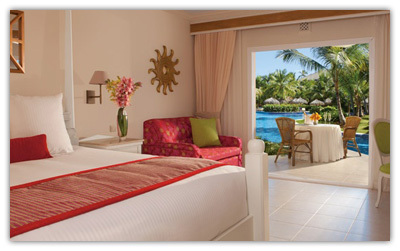 The Dreams Punta Cana Resort & Spa offers 620 luxurious rooms and suites with modern furnishings and beautiful views. Each elegant accommodation includes a daily refreshed mini bar, large bathroom with a bathtub and shower, luxury bath amenities, 24 hour room service, concierge service, twice-daily maid service, air conditioning, ceiling fans, satellite TV, CD and DVD players, alarm clock with an MP3 dock, in-room safe, coffee and tea maker, iron and ironing board, wireless internet access (surcharge), and a private balcony or terrace. Ground floor rooms have a hammock on the balcony. Deluxe Room Garden or Pool View – Features one king or two double beds, a full bathroom with a separate bathtub and shower, and a private furnished balcony or terrace with garden or pool views. 291 square feet. Deluxe Family Room Garden or Pool View – Features two connecting Deluxe Rooms, one with a king size bed and the other with two double beds. The private balconies offer beautiful views of the garden or pool views. 582 square feet. Deluxe Swim-Out Room Pool View – Features one king size bed, a full bathroom with a separate bathtub and shower, and a private furnished balcony with walk-out pool access. 291 square feet. Preferred Club Deluxe Room Tropical View – Features one king or two double beds, a full bathroom with a separate bathtub and shower, and a balcony or terrace with tropical views. 291 square feet. Preferred Club privileges include personalized check-in and check-out with concierge service, Preferred status and amenities, access to the private lounge and beach area, upgraded mini bar service, pillow menu, upgraded bath amenities, daily continental breakfast at Oceana Restaurant, afternoon hors d’oeuvres in the private lounge, desserts and fine liquors in the private lounge, complimentary internet access in your room or suite, complimentary newspaper in room each day (English or Spanish), and complimentary computer access in the private lounge. 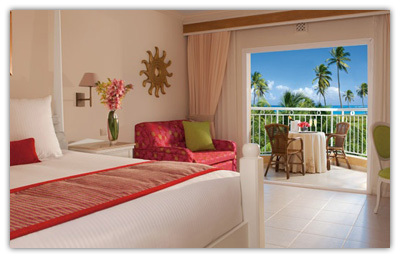 Preferred Club Deluxe Family Room Tropical View – Features two connecting Deluxe Rooms, one with a king size bed and the other with two double beds. 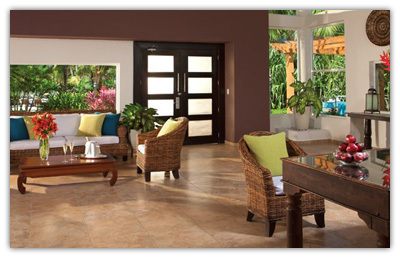 The private balconies offer beautiful tropical views. 582 square feet. Preferred Club privileges include personalized check-in and check-out with concierge service, Preferred status and amenities, access to the private lounge and beach area, upgraded mini bar service, pillow menu, upgraded bath amenities, daily continental breakfast at Oceana Restaurant, afternoon hors d’oeuvres in the private lounge, desserts and fine liquors in the private lounge, complimentary internet access in your room or suite, complimentary newspaper in room each day (English or Spanish), and complimentary computer access in the private lounge. Preferred Club Honeymoon Suite Tropical or Ocean View – Features a king size bed, a spacious living room, and a private terrace with a Jacuzzi and tropical or ocean views. 615 square feet. Preferred Club privileges include personalized check-in and check-out with concierge service, Preferred status and amenities, access to the private lounge and beach area, upgraded mini bar service, pillow menu, upgraded bath amenities, daily continental breakfast at Oceana Restaurant, afternoon hors d’oeuvres in the private lounge, desserts and fine liquors in the private lounge, complimentary internet access in your room or suite, complimentary newspaper in room each day (English or Spanish), and complimentary computer access in the private lounge. 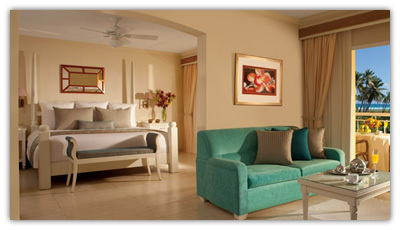 Preferred Club Junior Suite Tropical or Ocean View – Features one king size bed, a living room area, and a private balcony with a Jacuzzi and tropical or ocean views. 615 square feet. Preferred Club privileges include personalized check-in and check-out with concierge service, Preferred status and amenities, access to the private lounge and beach area, upgraded mini bar service, pillow menu, upgraded bath amenities, daily continental breakfast at Oceana Restaurant, afternoon hors d’oeuvres in the private lounge, desserts and fine liquors in the private lounge, complimentary internet access in your room or suite, complimentary newspaper in room each day (English or Spanish), and complimentary computer access in the private lounge. Preferred Club Master Two Bedroom Suite Ocean or Pool View – Features a Junior Suite with a king size bed connected to a Deluxe Room with two double beds. There is also a spacious living room and two private terraces, one with a Jacuzzi. 906 square feet. Preferred Club privileges include personalized check-in and check-out with concierge service, Preferred status and amenities, access to the private lounge and beach area, upgraded mini bar service, pillow menu, upgraded bath amenities, daily continental breakfast at Oceana Restaurant, afternoon hors d’oeuvres in the private lounge, desserts and fine liquors in the private lounge, complimentary internet access in your room or suite, complimentary newspaper in room each day (English or Spanish), and complimentary computer access in the private lounge.